I had my head down working yesterday when the news broke that my Congressman, Scott Rigell, will not endorse the Republican nominee for LG, E.W. Jackson. I applauded him on my Facebook page for having the courage to do this. But I was quickly disappointed to learn that the lack of endorsement didn’t mean a lack of a vote. I don’t know why Rigell had to go there; after all, a vote is a private matter. Look, I know Rigell is a social conservative. That he’s come to support civil unions is a big step. But surely he knows the role of the LG – and how casting a tie-breaking vote has become a lot less rare these days. I think it’s clear how, if elected, Jackson would cast votes related to the LBGT community. 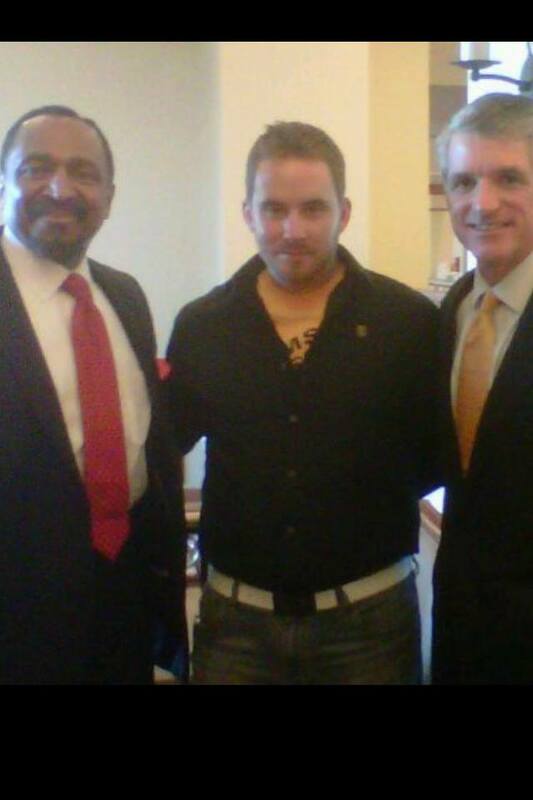 I found the photo that accompanies this article on Rigell’s Facebook page. Photos, by themselves, mean nothing; heck, there’s probably some of Scott and me floating around 🙂 But I am disturbed about his connections to Jackson and in the coming days, I hope to learn – and share – more about this. Yes, “this was Rigell being Rigell.” Was it also the Pilot being the Pilot, pitching Rigell to moderate and progressive voters? Or did their reporter just not get it? Either way, they’ve eroded my expectations of thoroughness and objectivity. Naw – I don’t think that was the case. The Post, after seeing the Pilot story, got a separate statement sent to them, as they stated in the article. The Pilot story was based on the editorial interview that Rigell sat for Monday, as he mentioned on Twitter & his FB page. I do think the Pilot should have updated their story with that additional information, though, even if it wasn’t a part of the interview. Irrespective of explanations and parsing, the only thing that is paramount in the mind of these gentlemen is political survival. Ideology, political labels, and actual beliefs are lower on their priority list to maintain viability in the public’s eye to be elected or re-elected. That, and only that, is the driving idolatry of lust for self-serving power. If there were a possible way to unring a bell, as it were, they would try. Their words are valueless and should be discounted as what sounds good to them to further develop a hypocritical personal agenda. I, for one, will not fall prey to the ridiculous rhetoric of “won’t campaign for, but will vote for”. Alternately, that statement discloses a feeble attempt at popular appeasement. Wally – I think you’ve got something there. Check out today’s article about Jackson here. Seems even Jackson is trying to moderate his stances. Ahahaha what a great rebuttal from Jackson. And what a nice job he did ensuring that his incendiary comments remain the focus of the news for the next 24 hours instead of allowing the GOP campaign to focus on something positive about Ken or negative about Terry. But I am sure if he manages to stay at the forefront for another couple of days, he’ll finally sort out how it’s not inconsistent to be pro-Civil Unions now without backing off his earlier comments from last fall about how homosexuality supposedly poisons society.